• Forecast future power prices? • Based on a changing market structure? • While taking into account volatile market conditions? 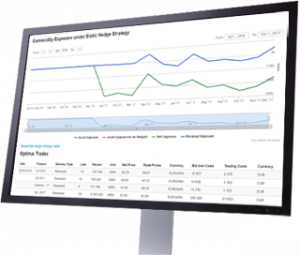 Then learn about our new energy market analysis tool: KyPowerFundamentals (KyPF), which is now part of the KYOS Analytical Platform. KyPF combines power market fundamentals & Monte Carlo price simulations! Traditional fundamental market models rely on deterministic forecasts of fuel and emission prices. But these price drivers are actually very volatile. KyPF offers a unique solution to take better strategic decisions in volatile energy market conditions, merging fundamentals with Monte Carlo. KyPF uses advanced techniques to identify the optimal hourly dispatch of all power plants in the market. It has the unique feature of integrating true Monte Carlo analysis with fundamental power market modelling, providing a much broader perspective on potential future developments than in the traditional deterministic fundamental market models. Moreover, it is easy to use with the web-based interface, sharing many features with the other models in the KYOS Analytical Platform. For more information about power market fundamentals & Monte Carlo, please download the description. Or contact us for a demonstration.